If you remember, Java by default adds a default constructor in every class but many programmers don't know that it only does that if you don't have any constructor in the class if by any chance you have defined a constructor which takes a parameter, then Java will not add it. This is also one of the reasons I suggest to always add default constructor in Java class, no matter whether you have more constructor or not. Java allows constructor overloading and you should take advantage of that. Btw, if you are using XML based configuration then make sure you are using right constructor on your config. Also, as per Spring Java documentation, A BeanCrationException is thrown when a BeanFactory encounters an error while attempting to create a bean from bean definition. 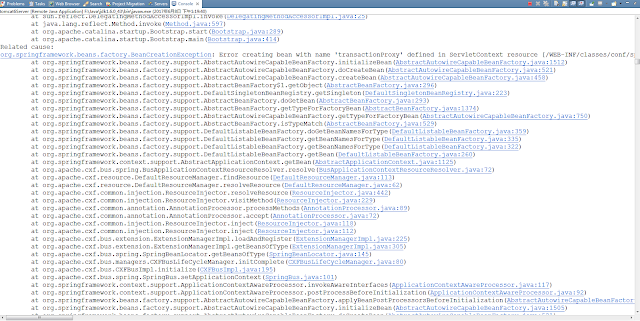 It doesn't say anything about the error, that's why you need to look at the nested exception to find the actual cause. For example, Like in this case, the nested error was BeanInstantiationException, which indicate instantiation of a bean failed. You should always pay attention to detailed stack trace as It also carries the offending bean class and reason e.g., in this case, it was trying to instantiate bean by invoking default constructor and couldn't find it. By looking at the error, you can conclude that whether you need to add default constructor or Spring is invoking a wrong constructor, which means a missing config somehow. Sometimes BeanInstantiationException is also throwing in Spring is not able to find the bean class in the classpath. That time you will see either NoClassDefFoundError or ClassNotFoundException as nested exception in the stack trace. Thanks for reading this article so far. If you like this troubleshooting guide and my explanation of Spring's BeanCreationException then please share with your friends and colleagues. If you have any question or feedback, please drop a comment.